Sweet Rupture Season 3 finally the official release! The third season of Sweet Rupture « Free Agility » is officially released since 2015 January 19th. This collective work orchestrated by Laurent Sarrazin includes stories of many « agile frogs » the number of which I have had the pleasure to be. This year, the frogs have mutated. Wings grew to release their agility, no longer confined to the IT department. This is now spread across the enterprise. So this book is an invitation to everyone to discover agility. As an expert witness and actor, I have enjoyed living this history from inside. The result is more than 400 pages of passionate stories, engaged and sometimes sirprising by so many new approaches to discover agility. The work was not easy, but we’re proud to share it with you. We have benefited from an awesome proofreaders team. Best of all, Isaac Getz (« Freedom Inc. ») introduce this book supporting our ambition not to confine agility to ISDs, but to open up to the world. For my part, you will find a story written with Fabien Bataille titled »Colibri: Change Agent detector ». I urge you to discover! It seems that since several that months, every full moon, frogs metamorphose into Hummingbirds. According to Native American legend, during a huge fire, only a brave Hummingbird dutifully poured water with its beak to extinguish the fire. Our Hummingbirds know that every time there is a fire in their business, the firefighters extinguished with a lot of job protection plan. Each time, the living space is depleted and the company, as a non-maintained forest catches fire even faster. By bringing into the game their passions and hidden talents, Hummingbirds self-organize whatever their formal function in the company is. Very soon this network is recognized and encouraged by few precursors leaders aware of damage created by command and control. They know the importance of leaving the doers decide how to do things. This story is an invitation to HR, trainers, managers, employees, agitators … in short all those wishing to contribute to free their business. Sometimes the desire to work differently is there, but concealed by the fact that everyone thinks he is alone and so can do nothing. The story below is the result of two people bet: One that allows the game to initiate a transformation « business how » into « a business why. » You’ll know at the end of this reading how to reproduce the same experience in your business. Thereafter, we will call Hummingbirds all actors of that experience. Yves, how were born Hummingbirds? The company where this story is taking place is a knowledge worker company that based its power on developing and following detailed plans. All the actors (executive, management and employees) agree it must be in tune to fit the twenty-first century and improve responsiveness as pursue innovation and ensure its long term survival. This production system is segmented into product lines, each divided into marketing, research, development, deployment and support. There are of course supporting functions such as Purchasing, Human Relations, Support or IT. We will have many representatives of these functions in our Hummingbirds session. Each department has its strong leader, superpower manager. He ultimately makes rain or shine while top level only power results in workforce adjustments based on strategic importance. It is hard in that context from Top leaders to make sustainable choices that are reflected in day to day reality of work. Agility is present here and there. Each department decided how he was going to work. Some few visionaries have set up agility under their perimeter up to five to seven hundred people (Our biggest known success so far). These departments often deliver « functional iterations » to customers, keeping in sight with a medium or long term product vision. There teams have the opportunity to lead technical choices, at least in equal footing with architectural features, expert profession, etc. The problem happens when a single product is mobilizing a system of several thousand people, eight countries, twelve different sites, thirteen time zones without counting the different business cultures. This goes far beyond a local leader as strong as it is to impose a way of working. The principle of organization that has proven itself in the twentieth century is to centralize decisions and enforce them to the bottom of the pyramid. Unfortunately this results in an addition of top down constraints, measures, controls, and hidden resitance. Obviously, these checks are introducing bottlenecks and delays start to accumulate. The lack of confidence also induced a complete loss of motivation which improves nothing. Locally, each autonomous organization addresses these constraints by refocusing on its objectives. The dialogue between departments disappear as it becomes secondary. In that context, Fabien and I are looking for a way to create the connection between these entities. We first tried to animate communities of practice which consist of bringing together people of different projects on themes to improve a particular practice. Despite our efforts, no one here takes time to come. Why learning new practices while everything seems imposed from above ? after all It sounds as waste one’s time while everyone is under pressure to deliver in conformance with top down orders? Our readings and meetings with people as Laurent Sarrazin put us on the track of using games techniques to create the link. A month later, we were proving the validity of our hypothesis by a first gamified session (and the name Hummingbirds has been chosen by those first participants ). This helped fill a room of about fifteen women and men passionated who obviously wanted things to change. Fabien, what was the first meeting? We were in February 2014. Shortly before the first session, Yves took his walking stick and went one to one to meet the canvass of his company’s knowledge and asked them to run workshops on the theme of the game. The posters announcing a presentation and workshop on « gamification », are strategically placed near the coffee machines. In addition emails to viral dissemination (all recipients were asked to forward the invitation to their colleagues) guarantee sandwiches or pizza the first record (the session taking place at lunchtime). This first session drains twenty people. Subsequently the spectators become actors of the next session and so on, the movement is started, it will not even be necessary to offer the meal. How does a typical hummingbird session ? Noon, Hummingbirds gently aggregate in a large room. Tables, footstools and furnitures are arranged randomly. In business, we all have a role and some objectives. To change roles, change surrounding. Already, one of the facilitators starts to set the pace by asking to make strange gestures, such as launching balls of wool, asking weird questions or to throw balls of colors but invisible! This host Hummingbird is the guard and catalyst of energy. Twenty past noon: After this warmup, four Hummingbirds are ready to present each one thing that fascinates them. Regarding these activities, there are very few rules: the subject and form are free. Only applies the rules of the site: here everything that is not forbidden is allowed. Fabien and I fix a single constraint: each presentation is done in a time box: These animations take place in parallel, Hummingbirds groups remain standing, and every ten minutes, sounded the gong, and they must quickly choose a different stand. One PM, Hummingbirds has attended all the workshops. We turn the tables, viewers return what they get of the show in a Lego® construction for each animation. This process inspired by the « Product Vision Box » allows a playful and natural return. Quarter past one : Hummingbirds end the session with a retrospective: We look at what worked well, what could be improved. Here, this retrospective is like the rest optional. But no one would leave without giving a spontaneous feedback or to be volunteer to prepare the next session: Each brings his idea and rules for the next session are decided. An example of change decided in a retrospective: slide shows are banned forcing organizers to be more creative. This provides more rhythm, spontaneity and fluidity in presentations: No over time to set PC to play slides, no anymore passive spectators sprawled on the seats, etc ..
Hummingbirds are time masters. Who are these clown who play while we have so much work to do for the paying customer ? The use of lunch time lets not waste time. For planning, such as ancient farmers, Hummingbirds follow a lunar rhythm. It just removes the school holiday periods. This repetition allows a reassuring routine. Hummingbird allows everyone to realize that whatever their level in the company, he has something to learn from others as a spectator but also to teach others, as well as learn of oneself when one becomes leader. From passive, one could becomes actor . Hummingbird, spontaneously created and maintained by employees without distinction of rank, jealously guards its independence. 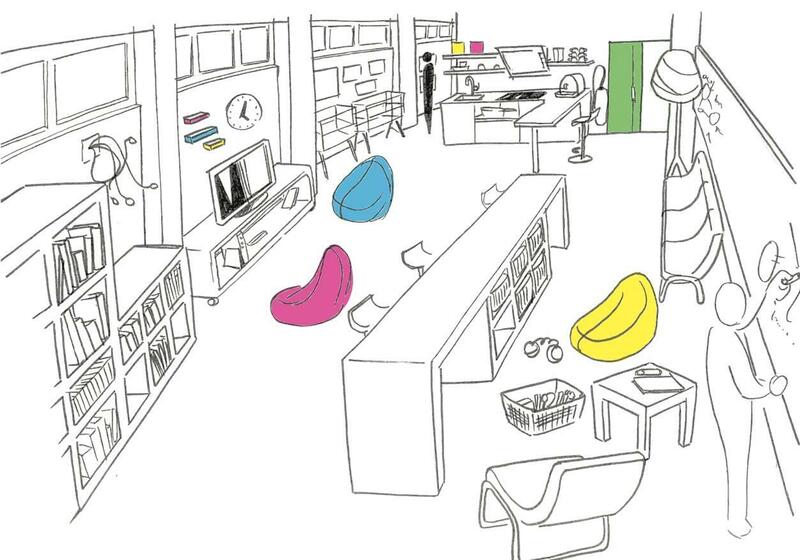 It naturally play along with other liberating initiatives, such as the Fab’Lab. A Fab’Lab is for a company to provide means (a room, equipment and some technical advice) to build objects or projects without any constraint. The « doers » in Fab’Lab as in Hummingbird are entirely voluntary. Hummingbird is unwilling to count « participants » but to swarm: in six months, some initiatives have already been initiated at a hummingbird sitting: a workshop on the « The 7 Habits of Highly Effective People« , a workshop to discuss methods of creativity, and a workshop to discuss science fiction and try to imagine the products of tomorrow. Eric Ries in his book « Lean Startup » explains that a principle not validated in practice, ie through experimentation, is literally a LEAP OF FAITH. A trainer writes: « my Training background » made me see Hummingbird in terms of learning, I saw the opportunity to sharpen my ability to briefly introduce a subject facing benevolent listeners« . The basic rules of the Hummingbird, its rhythm, Feedback by Lego® are all inspired by playing techniques. The game makes a person repeating something that she would not make again otherwise. A good game makes its players reaching a higher level when all the basics from previous layer is mastered. This interest in the use of games mechanisms to achieve serious results us was inspired by a presentation of gamification, in French: « ludification« . These innocuous technical abound on the web. For example, Linkedin or its competitor, Viadeo offer discrete gauges of progress, competence grading and other skills scores or grades. All this encourages us to fill their database with information that we would otherwise probably not put there. Let’s see where is the self-organization in « The New New Product Development Game » 11. This article on best practices in the industry was published in « Harvard Busines Review ‘in the late 80s by Hirotaka Takeuchi and Nonaka Ikujiro. It is the first to describe Scrum by analogy with rugby team that gangs up on the adversarial team . They co-decide together (what we call a holistic approach) tactics to win. A rugby team on the field is self-organized, as is an Agile team. It forms a relatively stable clan and tactics can far exceed, the sheer force added of each of its members. The scrum allow the group to be more efficient by being able to adapt in real time to the current situation. In the field it operates in isolation . Creating many natural (i.e natural dialog) links and bridges between group is mandatory to avoid Silo effect. This openness is essential to go from Agility Team to Corporate Agility. Scrum are like living Cells: Cells are both autonomous and interacting with other cells in a natural way so that the full body is both resilient to micro and macro adversity. This is the spinal cord of the company enabling the organization to have good reflexes without being slowed down by the over centralization. The goal is then to make the all more effective rather its subparts. Isaac Getz and Brian M.Carney in Liberty & Co. give us the key in their « Freedom Inc » book13. One example of that book is Favi company. It boss Jean François Zobrist, also handyman, compare the time it would have taken to repair a lawnmower in his own business, compared to the time he spent once at home. His conclusion is an obvious chronical structural inefficiencies his company had. He, therefore consistently removed all « How » guidelines to allow everyone to just focus on customer satisfaction. Some time later, a Christine a housekeeper took full initiative to seek a major customer hung out at the airport. She was the only one available, so she took the keys of a company car without any form of permission and made the 300 km that separates Favi from Airport. What matters in a « freedom Incorporation » is « WHY » we do something: Christine even if this is nort part of her usual mission honors a « moral » obligation for here company , to delight the client15. It is sometimes difficult to explain inside the company’s what is exactly Colibri’s target. 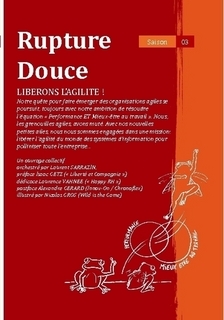 Is it about demonstrating the strength of « gamification« , those of Agile principles, Lean, or freedom Inc. ? One participant found an answer: The key is to build from a group of people an effective team who is efficient to reach motivating enough goals, with only condition to have the freedom to reach it and it actually happened. According to the philosopher Michel Serres, Human beings start eventuating its skeleton qualities (sharpened flint tools, levers, etc.) then its muscle strength and thermal system (engines), and finally its nervous system (computer, network, digital) 16. We think that In this world that evolves in complexity to the speed of the digital revolution, having a unifying vision that suits the market at the right time is only useful if this vision is achievable quickly. Building first on self-organized and open groups, radically remove bureaucratic brakes will make the best teams and the best companies. Whether you’re a business owner, manager wanting to change or « doer », we encourage you to start a liberating initiative to your level, a Hummingbirds bringing a little happiness and freedom in her mouth. 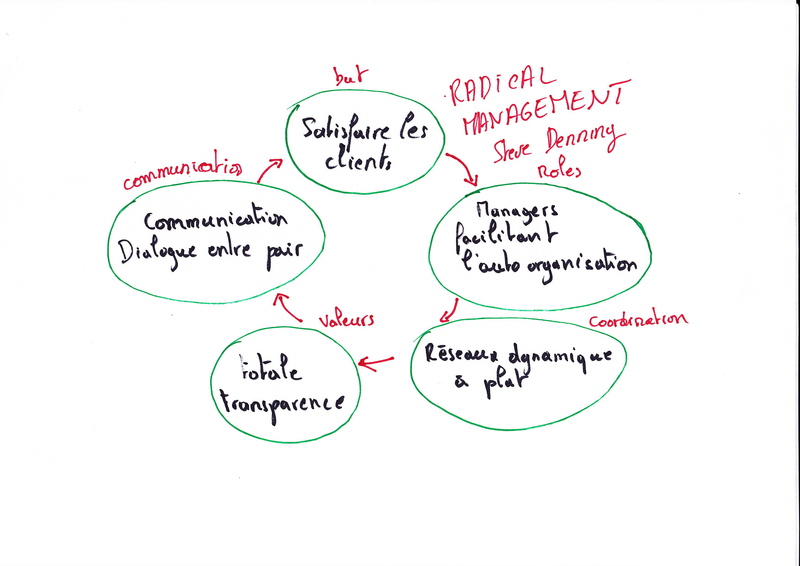 Fabien and Yves felt in the potion Agile and benefits of self-organization a few years ago. 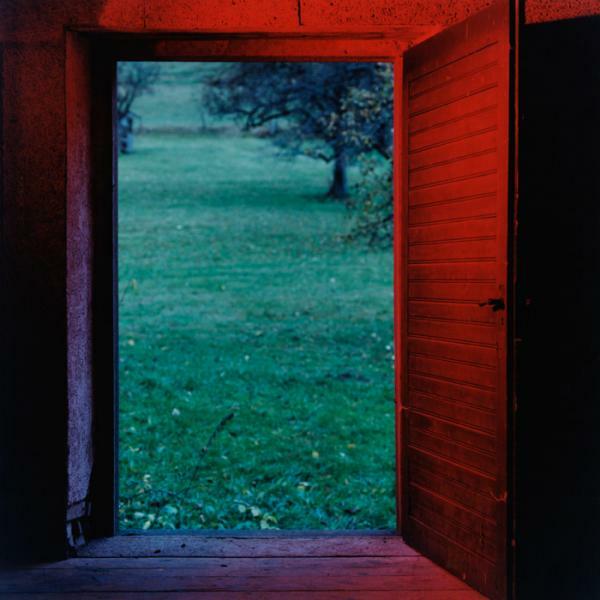 We are also fans of Sweet rupture Season 01 and 02. We are Fish and Fishing Rods supplies: With Hummingbird, we animated games (giving fish) before facilitating sessions (providing fishing rods). But now Hummingbirds are the real Game masters. They constantly invent. We are facilitators us when our availability allows. Fabien is a former Bell Labs–researcher training software engineer, he discovered agility and Lean in 2010. Since it is always looking for continuous improvement in all their forms. In addition to his work at a large telecom equipment, he also teach Agile and Lean software project management to Master 2 students at the University Paris Descartes. In his spare time he helps the group « agile translators »18 translating into French books and articles dealing with the agility to help their dissemination. Follow him on twitter19 or throught his blog20. 2 This legend was popularized by Pierre Rabhi when creating the Movement of Hummingbirds ( Colibri is the french name for Hummingbird) http://www.colibris-lemouvement.org/. Although we have a slightly different purpose, we concur on many topics. This is an interesting large scale transformation from Alexis and my friend Raj. Over 500 people. Customer wanted to find new disruptive revenue stream. They start by co creating the the vision with leadership. Implementation used SAFE, Scrum and many other Lean Agile Tools and more importantly Principles. Interesting way to use a reverse Conway law, setting the team the way they want architecture to be sounds to be a great approach when having day 1 cross functional team does not works. That stage approach is also a good trade-off to the now old fashion Big Bang. Smell like a new sweet rupture. Last November, Alexis Hui and I presented a case study representing a very unique and successful agile transformation in a global financial services organization. Video and slides available on InfoQ, recorded at the Agile Toronto Community Conference. In this article I will explain how to improve product development flow and deliver value faster. I will describe how a few small changes in the way we are organized can make a significant difference in our value delivery potential. These insights are based on some widely held theories and – more importantly – practical experience gleamed from working with numerous companies, in an array of industries. I will also explain the place and importance of uncertainty in our working world and how a more Lean mindset can help us view this uncertainty as as opportunity to better understand – and exploit – our options. Before we think about delivering faster, we must make sure we are developing the right product. A useful map for navigating your way into the concepts and field of complexity is « The Stacey Matrix ». It is important to clarify our assumptions on where we are before choosing one approach. 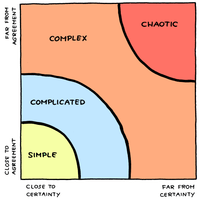 Agile has a proven record in complicated and complex zones. Lean is excellent for Complicated situations. And Lean Startup is probably the best approach to date in matters Chaotic. The temptation to oversimplify when we need to explain complicated or complex problems is understandable, even to some extent our attempts to describe things that are chaotic in nature. Unfortunately in adopting this mindset – this oversimplification – we devalue and reduce the likelihood that we can fully understand this inherent uncertainty, and the potential to use this to our advantage. Let’s assuma we have a gain opportunity of 40€ if sum of drops is 7 or more. 0€ if 6 or lower. Cost of 10€ per roll and per dice. Even if amount is small same player can play as quick as he wants. The casino take 17% off of all gain for services. Average gain: 23€. 19,9€ after casino charges, Average cost: 20€. (*) this is how casino makes money. What if you could use feedback loop ? i.e rolling one dice, look at the result and decide to roll or not to roll the second one. What would we intuit about our chance to gain 40€? Calculation at the end of the article. Even if the second strategy sounds more complex. It is still more valuable. Despite the immediate feeling of failure failed (here by getting an ace at fisrt roll) we should use it as learning to take decision. Small decision sometime give small benefits but this is still a value for the business if decisions are taken and executed with speed: An experimented gambler could play one game every 5 second i.e 720 games in one hour. His/her average gain could be up to 720€ per hours. Even if casino is of course based on uncertainity, Such a gambler has no risk of failure with so huge number of drops. A system able to take very fast small decision transform uncertainty into more predictible results. We could say it reduce uncertainty but it would be not acknoledging that uncertainty is the issue to solve not the one to underestimate. Of course, taking many fast decisions will be a competitive advantage if those are in average good decisions. Here, gamblers are experts in both analysing feedback and executing the right corrective actions (i.e do not roll the second dice if an ace occurs at firt roll) when appropriate. This intense use of feedback and multiple fast decisions close to the floor plant is one of lean principles. All Agile teams I know also make sure to have maximize feedback prior considering a job as finished. It is why test skills are so important on side of coding building and architectural skills inside a single scrum team. Now let’s say you own a company employing up to 1000 gamblers. As soon as you heard about this casino and their ‘generous’ rules, you made the strategic decision to deploy your gamblers to this high lucrative game. This is centralized decision making. You then explained the principle of feedback to your employees and how it can be used to help them make better tactical decisions – you decentralized the execution. Very soon the casino discovers your strategy and changes the rules. News of the changes will quickly propagate through your network of gambler employees. Now, let’s imagine your Gamblers are not allowed to take the initiative to stop gambling or even to look for new ways to make money, at the same time they inform you that the dice are no longer loaded in their favor. This information flow – from ground to governance – is the second feedback loop and is exactly how firms should operate. Non aligned decisions are avoided by having a clear system of governance. The aim of governance is to only take strategic decisions that will inform all linked actions – execution details and policies are decided on the ground, with support from ‘enablers’ to bridge the gap and provide operational support. In his book about organizing for complexity Niels Pflaeging describe it by concentric circle . 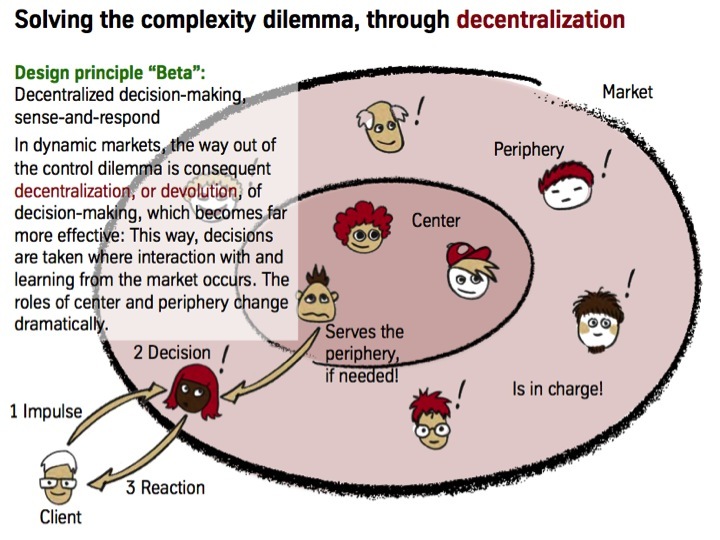 The market is at the periphery. At scale some centralization might be needed at the center. Of course the more direct the contact is between people at the center and those at the periphery, the better. Role of people at the center is to take right decision to help those who serves the market. They also always try to reduce cognitive distance between them and people close to the circumference. Finding the right balance is not easy: The famous motorbike manufacturer Harley Davidson® took a radical approach to delegate all « non strategic » decision to the factory floor and also to share all business information, including cost margins. Those figures used to be confidential in traditional enterprise but not in Freedom Inc. They also encouraged/required companies in their supply chain to do the same thing. And the result was quite remarkable – customer satisfaction went up and so did profits. Another example is Value Stream Mapping, which focuses on the interdependence of the twin flows of material and information. This is not about scientist calculation of what would be better, but instead is an exercise in learning through observation and visualizing what actually happens. My 2 cents tip is just to make all task done by the team visible. To do so, there is nothing better that using the room wall. The most interesting part is to show where work or information is waiting, how long it has waited, and what is the consequence of that wait. Some teams move a vertical bar to track the number of days expended in an iteration/sprint. On the factory floor, this would be inventory. In product development, this is just queues. On the factory floor, this would be inventory. In product development, this is just queues. One operating principle that Agile uses is to avoid any internal queues inside the team, or limit as much as is practically possible. This requires an ongoing diligence from the team. And even with the best intentions there are thousand of reasons to have queues of either information or partially finished products. The main question is which queue should I take care of first. 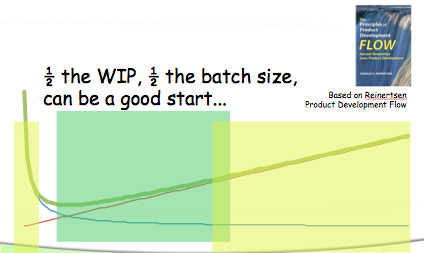 Even in agile there are thousand of reason to have queues or either information or partially finished products. The main question is which queue I should take care of first. Don Reinertsen gives a very good principle to to do that. He suggest to attach an economics indeed a cost to each queue. name for that is Cost Of Delay. Then the game sounds like the Dice early game of that article. Gamers just tackle the highest cost of delay first. In Agile, this is I think the best way to order any queue. From initial idea, to funneled idea ( that came with some business and rough estimate assumption) to idea read to be executed, to idea under execution and deployment. Flow has been studied for long on highway. a simple approach is called the Greenshield’s Model. Greenshield made the assumption that, under uninterrupted flow conditions, speed and density are linearly related. This relationship is expressed mathematically and graphically below. Mary Poppendick show that batch size has also a tremedous impact on the Flow, smal bacth are less sensitive to load. Only limitation is the transaction cost, which are fixed cost. In Lean this is called SMED ( Single Minute exchange of Die by analogy to changing die in car parts manufacturing going from days to few minutes in Toyota Produc System). Optimum value is where transaction cost is about the same amount than the waiting cost. The graph below show how it affects the flow. 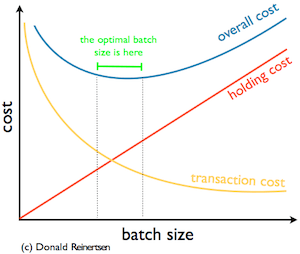 Here transaction cost is about 1/4 of smaller batches. When operating over 80% we mainly pay tax, indeed jobs spend far more time in queue than running. 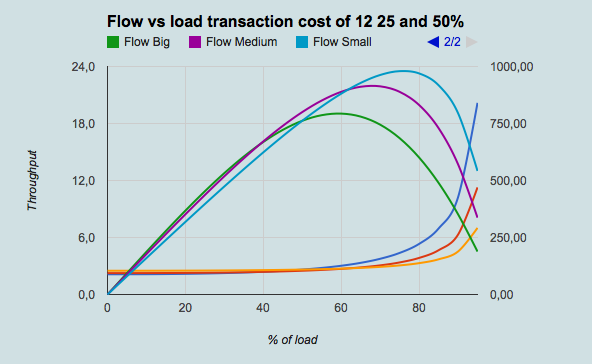 At 80% of load, Big batch cost about 60% more. Even surprising, I had the chance to see that many times and this is used in all computer congestion algorythm. All good Agile teams practice this by defining work items that bring value to a customer ideally sized about 1/10 to 1/3 of their fixed iterations duration. Reducing the size of the work is only beneficial if we agree not to do too much work at the same time. This is done by limiting the work in process. This is what Kanban brings to Agile. Even if this seem obvious, this is the most difficult part of team works. This could mean working with others on something we do not know perfectly because this is the highest priority and not something I know the best. Teams generally need to practices. One tip here is to look for the numerous kanban games and play some with the full team. Management could also affect negatively Kanban. Even if they understand the need to have less centralized decision, they might still push for urgent things without going through the Cost of Delay. Just by the fact that management is too often setting goal for the team instead of the customer, many companies has a huge cultural biased against organization for speed. Good news is that more and more company get rid of goals and objective set by management for benefits of goals set by the customers. Jurgen Appelo develops a good vanilla compilation of management tools and techniques that could help having management back into the race of improving the speed. 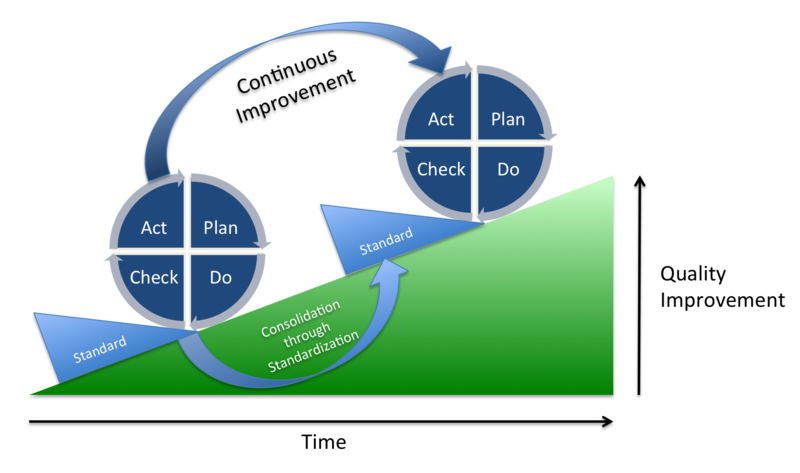 I would rather recommend to look at kanban simulation tool and see how this also reduce dramatically the variability. We are not used to limit the work in process. Instead we love being busy occupied. Instead we should really take care about developing a Discipline Of Delivery. Our business assumption are not always easy to validate. I will not detail here since Lean Startup would be a far better answer. Due to Cultural and historical biased we tend to over-centralize decision even multiply number of layers. This is the main management roadblock and slow down the full system. Do not start something else before you have reached the quality the end customer will need on the previous items. This is done by making sure there is an agreement on what to do , how much ( Acceptance criteria ) and how well ( Definition of done). Make daily things visible so that you will see bottleneck(s). There are many ways to do visual management but using a physical wall is my favorite. Spend 15 minute a day describing on that board what’s happened since last day, what ‘ next and what could be done to be faster on the highest cost of delay priority. Make sure you set/collect measurements such as cumulative flow diagrams and have dedicated time at regular intervals to look at how to improve the process/change the WIP limit..
Cognitive distance Cognitive distance is used to describe how two individuals are different, at the knowledge level, but also in the way they perceive and interpret external phenomena, that is to say somehow in their modes of reasoning. Nooteboom (2000, p. 73) defines the concept: « a difference in cognitive function. This Can Be a Difference in domain, range, or mapping. « The more individuals have different functions or « mental models », the more the cognitive distance between them is important. Rupture douce, un concentré d’Agilité a réitéré en sa saison 3. On y parle d’Agilité à l’échelle de l’entreprise. Page 88, on y lit l’histoire de Colibri décrite plus bas dans ce blog. Colibri https://twitter.com/colibri21th, c’est l’utilisation du jeux pour montrer en quoi l’invention et la curiosité restent des atouts majeurs surtout lorsque le cadre est devenu exiguë, hyper contraignant. Certains (plus sérieux ?) vont plus loin. https://twitter.com/BellLabsGarage nous parlent d’innovation « Inside The box ». Nous on pense plutôt bac à sable façon Lean startup d’Eric Ries. Un espace de liberté pour créer sans contrainte et sans réel budget. Dan Pink (Drive) nous parle d’Autonomie, de Maitrise et de Finalité. Et si l’ultime finalité c’était juste le bonheur. Colibri au final crée donc juste du bonheur au travail. Mais en ce faisant il résout les problèmes de silos, juste comme ça, sans pression, sans ce qu’on appelle à tord la résistance au changement. Comme le dit Fabien Bataille : « BINGO Nous venions sans trop nous y attendre de créer un détecteur d’agent du changement de l’entreprise ». Dans Rupture Douce saison 3 on libère l’agilité, mais en faisant cela c’est l’entreprise que l’on fini par libérer. Lorsqu’on a imaginé Colibri21th avec Fabien Bataille ( http://agile-lean-et-compagnie.com/) on avait pas pensé publier quelques mois plus tard dans un livre préfacé par Isaac Getz vecteur du management libérateur. Dans quel contexte d’entreprise sont nés nos Colibris et pourquoi nous pensons que l’auto-organisation est un passage obligé pour une transformation Agile ? L’entreprise que nous avons choisi de ne pas nommer, ressemble à de nombreuses très grands groupes adaptées au 20eme siècle. Celle ci a besoin de se mettre au diapason du 21eme siècle essentiellement pour gagner en réactivité et innovation afin de survivre sur le long terme. Nous nous sentons donc comme de petites grenouilles plus ou moins engagées au sein d’un énorme système dont la culture est multiple. Cela reflète bien un passé riche en fusions- acquisitions. Cette machine à produire est segmentée en lignes de produits sous divisée en grand compte, marketing, recherche et développement, déploiement, support. Il y a évidemment des fonctions transverses : Achats, Relations Humaines, Information et Technologie. Nous avons d’ailleurs beaucoup de représentant de ces fonctions dans nos séances Colibris. Chaque département a un chef et c’est lui qui au final fait la pluie et le beau temps. Évidemment les visions de plus haut niveau existent et se traduisent par des réajustements des effectifs en fonction de l’importance stratégique. Il est assez difficile à nos grand dirigeants d’opérer un choix durable dans ce contexte où les décisions sont prises au final par les chefs locaux et où au final les contraintes des marchés dictent les effectifs. L’agilité y est plutôt bien présente et cela un peu partout. En effet chaque service ou département a décider comment il allait travailler. Il y a souvent à leur tête de bons visionnaires qui ont mis en place l’agilité sur leur périmètre de cinq individus à sept cent personnes ( pour ce que nous connaissons comme réussite de plus grosse taille). Voici ce que donne une transformation réussie vers agile. A la fin, on livre souvent des itérations fonctionnelles « aux clients », en gardant en ligne de mire une vision de produit moyen voire long terme et les équipes considèrent qu’elles ont la possibilité de conduire les choix techniques, au moins d’égale à égale avec des fonctions d’architecture, d’expert métier etc..
Que faire si un seul produit mobilise un système de plusieurs milliers de personnes, huit pays, douze sites différents, treize fuseaux horaires sans compter des cultures d’entreprises différentes, le tout dans un contexte où il faut faire mieux pour moins cher, la concurrence y veille. Cela dépasse largement le cadre d’un leader local capable d’imposer une façon de travailler à un groupe restreint. L’organisation dans ce cas est issue du 20 eme siécle consiste à centraliser les décisions et de les faire appliquer jusqu’en bas. Malheureusement cela se solde par un ajout de contraintes de mesure, de contrôle et de rejet entrainant des délais, le retour au plan augmente la pression. De plus, ces vérification introduisent des goulets d’étranglement et des retards cumulées parfois de plusieurs mois surtout lorsque les contrôleurs sont dans un fuseaux horaire différent du notre. Ce manque de confiance induit une totale perte de motivation ce qui n’améliore rien. A l’échelon local, chaque organisation autonome répond à ces contraintes en se recentrant sur ses objectifs. Le dialogue entre départements disparaît car il devient secondaire. Fabien et moi cherchions un moyen de créer ce lien entre ces départements. Nous avions des agendas remplis d’activité et à la fois vides de sens. Nous avons longuement cherché à animer des communautés de pratique : En Agile, cela consiste à réunir des personnes de projets différents sur des thématiques visant à améliorer tel ou tel pratique. Malgré nos efforts, personne dans un tel contexte ne prend le temps. A quoi bon apprendre de nouvelles pratiques alors que tout semble imposé par la haut ? Nos lectures, nos rencontres nous ont mis sur la voie de l’utilisation des techniques de jeux pour créer du lien. Un mois plus tard, nous prouvions le bien fondé de notre hypothèse par une première séance de ludification et de jeux sérieux ( Ce sont ces mêmes participants de la première heure qui ont choisi de s’appeler ensuite les Colibris). Cela au moins permet de remplir une salle par une quinzaine d’hommes et de femmes passionnés qui visiblement ont envie que les chose changent. BINGO ! Alors quelles suites à Colibri? La création de contact entre personne du même site a déjà permis de rapprocher des populations transverses de personnes impliqués dans les projets, limitant les malentendus du type: Ces personnes des outils ne savent pas de quoi nous avons besoin, où ces gens de tel ou tel projet ne savent pas travailler. Colibri garde son indépendance mais se rapproche naturellement d’initiative telle qu’un Fab’ Lab. Un Fab Lab consiste pour une entreprise à fournir des moyens ( une salle, et du matériel ) en vue de construire des objets parfois même des mini-projet sans aucune réelle contrainte. Cela se fait en dehors de toute pression hiérarchique (parfois sans support non plus) . Les faiseurs comme dans Colibri sont entièrement bénévoles. Peut être un jour aurons nous la chance d’avoir des dirigeants suffisamment visionnaires pour adhérer pleinement à l’autoorganisation tel que celles qui naissent lors de séances Colibris et à créer des groupes de travail sur des thématiques concrètes tel que la réduction de temps des projets, la co-localisation des projets. Ces groupes ont et continue d’exister mais leur objectif se limitent trop souvent à faire des recommandations. Que se passe t il si une de ces recommandations interfère avec les choix des dirigeants locaux? Colibri: Qui sommes nous et que sont nos croyances ? Commençons par Lean Startup1 Eric Ries dans son livre Lean Startup nous explique qu’un principe non validée en pratique est littéralement un acte de foi. J’ai eu la chance de pratiquer de l’aïkido. Bien que niveau soit faible j’y ai appris qu’en Aïkido comme dans de nombreux art martiaux, il existe une poignée de principes tous assez simples. Évidemment, il faut des années d’entraînement avant de mettre en pratique de tel principes. l’amélioration continue et la recherche de perfection y est constante. Même si un maitre aide de part ces observation et recommandation. Mon faible niveau tiens bien de mon manque d’entrainement et d’auto discipline. Dans Colibri, les règles simples , le rythme et le recueil final des retour par des légo® sont inspirés d’innovation game2. C’est à dire l’utilisation des techniques de jeux pour obtenir quelques choses soit d’un client soit dans notre cas d’une équipe. L’intérêt de la réutilisation des mécanismes de jeux pour obtenir quelques choses n’est pas nouveau. Le nom anglosaxon est gamification, nous avons eut du mal à trouver une traduction en français. Le terme ludification nous a été proposé par un participant. La ludification est utilisée par tout les sites en ligne sur internet. Par exemple, le très sérieux Linkedin ou viadeo offrent de discrètes jauges de progrès, des classements de compétences et autres scores ou grades. Tout cela nous pousse à renseigner la base d’informations qui sinon n’y figurerai sans doute pas et donc valorise le réseau auprès de ces sponsors. Comme le sport, le jeu permet aussi de faire répéter une action à une personne qui ne le ferait pas sinon. Cela peut est plutôt positif dès lors que le seul but est de mener le joueur à maitriser tel ou tel geste ou pratique. Un bon jeux passe ensuite à un niveau supérieur où l’on considérera cette première actions comme maitrisé. Voyons où se situe l’auto organisation dans The New New Product Development Game. Cet article sur les meilleurs pratique dans l’industrie a été publié dans l’Havard Busines Review à la fin des années 80, par , Hirotaka Takeuchi et Ikujiro Nonaka. C’est le premier à décrire Scrum. Scrum signifie la mélée en analogie à celle d’une équipe de rugby qui fait bloc et co-décide tous ensemble ( ce que l’on appelle une approche holistique) les tactiques pour gagner. Car une équipe de Rugby sur un terrain est bien auto organisé comme le sont les équipe Agiles . Elle forme un clan relativement stable et dont sa tactique permet de dépasser de loin la pure force additionnée de chacun de ses membres. Revenons à notre redécouverte à nous les Colibri d’un exemple d’auto-organisation: New Games3 Ce livre indique en quoi la collaboration et la compétition, sans pour autant chercher à gagner, génèrent du plaisirs et rassemblent des personnes de tout milieux sans violence. L’analogie avec le Rugby n’est pas si lointaine pourtant ici les jeux, comme le contenu de Colibri sont sont laissés au libre choix des participants. La différence majeurs est qu’ici nous n’avons pas à faire qu’à des clans de rugbymen sur-entrainé mais de femmes d’enfants et d’hommes sans aucune hypothèse sur leur aptitude physique ou intellectuelle ni même d’entrainement ou d’excellence et qui peuvent changer de groupe voir de camp quand ils veulent. Il s’agit donc d’une ouverture. Cette notion d’ouverture nous paraît donc essentielle pour passer de l’Agilie d’équipe à l »Agilité à l’échelle d’une Entreprise, chaque équipe doit alors coopérer avec beaucoup d’autres afin de travailler sur l’ensemble de la chaine. Ce livre sur les new Games, en plus de décrire quelques jeux pour démarrer ( voir poisson et canne à pêche), donne des conseils précieux sur comment organiser un tel événement: comment obtenir un terrain, comment promouvoir l’événement, comment assurer la sécurité de plusieurs milliers de participants en pleine campagne sur des jeux très physiques. Dans le cadre des new games, cela a permis que de nombreux jeux aient lieu avec de participants sans aucun accident mortel. S’il n y a pas de chef et si les jeux en eux même sont auto organisé, il existe bel et bien un cadre une gouvernance qui définit comment cela va se passer. Le minutage de Colibri, la réservation et l’organisation des séances, la diffusion virale sont aussi des mécanismes de gouvernances. Par contre l’idée est d’en faire le moins possible. Dans notre cas, cela consiste uniquement à offrir un cadre agréable et propice au succès des jeux et à revoir ce cadre lors de notre rétrospective. Finalement c’est ce qui se passe chaque fois que l’on organise une fête entre amis avec l’idée de servir les autres avant tout. L’enjeu n’est que du plaisirs celui d’être ensemble, et peut être celui d’avoir une fête particulièrement réussie. Cela s’approche d’une philosophie de management appelée « Servant Leadership »4. Bien qu’il n’existe pas de traduction française qui nous satisfasse, on parle parfois dans la communauté Agile de pyramide inversée. On y représente les joueurs (les faiseurs) comme au somment de la pyramide. Le livre « Les employés d’abord, les clients ensuite : Comment renverser les règles du management » de Vineet Nayar5 approfondi ce concept. The new new product development game indique aussi que l’Agilité nécessite un contrôle mais un ce contrôle subtil. Que signifie donc un contrôle subtil ? Isaac Getz et Brian M.Carney Liberte & Cie de Brian M. Carney (Auteur), Isaac Getz (Auteur) eux parle dl’entreprises libérées6 . Ils nous donnent une des clés de ce contrôle subtil. L’ouvrage basé sur l’expérience de quelques entreprises dont Favi7 Jean François Zobrist, patron mais aussi bricoleur a réfléchi au temps qu’il lui aurait fallu pour réparer une simple tondeuse à gazon dans sa propre entreprise comparé à celui qu’il venait de mettre chez lui. Nous sommes sûrs que vous trouverez un exemple similaire dans votre entreprise. Zobrist est arrivé à la conclusion d’une inefficacité chronique et structurelle de Favi . Il a donc ensuite entièrement simplifié la bureaucratie d’où le terme « libérer ». Quelque temps plus tard une femme de ménage a pris l’entière initiative d’aller chercher à l’aéroport un client important resté en rade. Etant la seule disponible, elle a juste pris les clés d’une voiture en libre service. L’étonnant est que dans n’importe quelle autre société on aurait blâmé la femme de ménage ou rappelé tel ou tel règlement bafoué. Dans le cas de Zobrist c’est normal. En supprimant la bureaucratie, il a transformé une entreprise « comment » en entreprise « pourquoi ». Dans le cas de Colibri, Alors que je demandais à O. Manager de l’innovation l’autorisation de coller des affichette sur les machines à café, Il m’a rappelé qu’il vaut mieux faire une petite bêtise que de se freiner l’autorisation. Ce fut pour moi un bel apprentissage et les affichettes furent collé. Privilégier le dialogue entre pair pour obtenir de l’alignement. Peut on parler d’auto organisation sans alignement ? Donner du pouvoir au personnes est donc ok à condition que ces personnes collaborent. Il va de soit que John Chambers sous entend dans le sens du client. Stephen Denning 9 explique en quoi le but satisfaire le client découle bien plus du dialogue entre pairs et non pas d’un alignement par les procédures, encore moins par une commande par le haut. Cela révolutionne l’idée répandu que l’alignement vient du haut. Choisir une exécution décentralisé supportée par une coordination centralisée. Une piste intéressante est pourtant de voir ce que nous avons à apprendre de l’art militaire. L’armée passe dans l’imaginaire collectif pour une organisation hyper centralisé ou l’obéissance aux ordres est la valeur suprême. On pense par exemple à la seconde guerre mondial, à notre tristement célèbre ligne Maginot. C’était une défense techniquement efficace construite précisément là où il paraissait logique que les allemand nous attaquent. Évidemment les Allemand ont contourné cette ligne Maginot. On serait donc loin donc d’une entreprise Agile idéale. Les développements de produit comme les opération militaires sont planifiés à l’avance et peuvent mobiliser plusieurs milliers de personnes. Les armées modernes ont toute compris que suivre le plan n’est plus d’actualité dès les premières minute de l’opération. En fait les militaires évitent juste l’idée simpliste que tout doit être centralisé ou décentralisé. l’exécution est décentralisé supporté par une coordination centralisée. D6: Principe inefficacité: inefficacité de la décentralisation coûte moins que l’intérêt d’avoir une réponse rapide. D8: Principe de la Mission: Spécifier l’état d’arrivé, pourquoi l’on fait les choses, et le minimum de contraintes à suivre. Un tournant au 21 eme siècle ?